There are a few basics that need to followed. The rest is elbow grease. Micah Hodges, Blaine Hoopes, and Jeff Turner. Before you can effectively polish the aluminum on your XS/XJ 1100, the clear coat and oxidation must be removed. Several techniques have been suggested on the list. The clear coat might be able to be removed by soaking in break fluid. Remove the part first and be careful to not get brake fluid on any other painted parts as it will eat the paint of them too. It takes time for the paint to be loosened so be patient. Remove clear coat using Aircraft Klean-Strip Remover (readily available at Walmart and Pep Boys). I've tried the paint remover and it works and fairly fast but is messy (personal opinion). In my case I had to brush, rinse along with multiple treatments and I still had "spots" that had to be removed during buffing.Also, I had to let the parts dry before I could start buffing. After a bout with the stripper I found that emory compound on an old buff would "burn" the stuff off in nothing flat and also clean up the part nicely for a final finish. Anyway, its an alternative process. Just don't use a good buff as the varnish / coating leaves a residue on the buff and loads it up. Also, emory is great for those deep gouges in the lower cases that seem to be present on a lot of cases. Polishing all that XS/XJ1100 aluminum can be quite a challenge. Before you can polish, you have to remove what's left of the clear coat that Yamaha put on at the factory. There are any number of good paint removers available from hardware stores, but there is another product which is quick and easy to use. Try Permatex spray on gasket remover. This product is available at most auto parts stores. It takes that old ratty clearcoat off fast! Then wash with warm soapy water and dry it. After polishing, you can clearcoat again if you want to, but it makes it a little duller. Any oxidized aluminum can be "sanded" with Scotch Brite pads. That'll clean the surface and give an even finish to work from. It has also been pointed out on the XS-XJ 1100 Mailing List that steel wool is NOT a good alternative because it embeds in the aluminum and promotes oxidation. Apparently stainless wool and bronze wool are acceptable. Be very careful about using household chemicals or acids on aluminum parts. Some may cause a chemical reaction and release potentially fatal poisonous gasses. Bring to luster using 600-800-1500 paper. Bill Kingson's current buffer is made from a 1/4 HP washing machine motor. He uses it to run an arbor with a double shaft. You can run directly off the motor, but having two shafts to work with saves set up time. Bill thinks that a real buffer or adapted grinder would work better. Dave Hogue uses adapted grinding motors with the ability to shaft off of both sides of the motor without the use of an arbor. He likes the set-up, but believes an arbor set-up would allow better clearance to work around. Here is a picture of Dave's set-up. "My son built a buffer like I said from a dryer motor (got the dryer for free). Threw away everything but the motor (only my son!). Then he got a 15" roughly 5/8" dia steel bar and machined it down to 1/2 for about 2" back on both ends. Then he threaded about half of that. I had two pillow block bearings (bearings in a cast housing that bolts to something flat). Those determined the diameter of the shaft. He has those situated so only about 4" of the bar ends are unsupported. This is one of the problems with this setup and the reason it won't work for polishing something big like the wheels"
As Bill and others have pointed out (there was a long thread on rpm's on the XS 11 list some time ago), trying to polish with a regular drill just doesn't work all that great. There are kits and supplies available for polishing with an electric drill, but a drill appears to be inadequate for heavy-duty buffing on large surfaces such as engine covers, and as stated above, just don't generate the rpm's for good cutting and a truly mirror like finish. Caswell Electroplating in Miniature recommends a speed between 3600 & 7500, and the typical electric drill is often well below 2000 rpm. Also, Rick has pointed out that the lower rpm's don't allow you to put enough pressure and the surface you are working on to get good results. For tight spaces, several on the XS 11 list have used a Dremel tool. Dave used his for the tight areas between and around head fins, and Rick has tried his on carbs. As most have found, however, the rpm's are there, but Dremel's polishing pads and cones don't last too long. Expect to go through a lot... at $2 to $3 each! Another solution for those of you with a large compressor would be a similar set of polishing tools for a hand-held die grinder instead of the Dremel tool. The benefit of this setup is that it does not spin as fast (Dremel tools often turn at 10,000-15,000 rpm) and some die grinders allow for variable speed operation. Also, the polishing cones for Dremel tools are much smaller than those for die grinders. One or more of the companies listed below sell buffing and polishing accessories that will work in die grinders. This tool requires lots of compressed air and small compressors (< 4 hp) will not be able to supply enough air. For most folks, the polishing wheel set-up (as as shown and described above) works quite well. NOTE: Sisal wheels are much too aggressive for aluminum work! 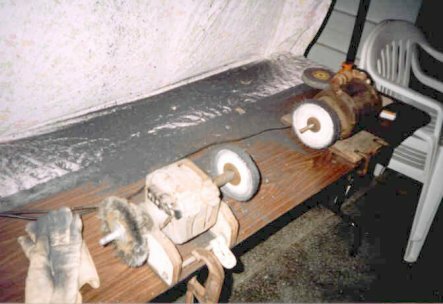 These are three types of buffing wheels offered by Brightworks (photo credit to Brightworks, Inc. Their URL is listed below). Note also that you don't have to go to the on-line sources for decent quality wheels. Sears, Lowe's and many other "hardware" stores sell what you need and, for most of us, are right around the corner. Caswell lists their compounds (again, from most coarse to least coarse) as black, brown, white and blue. 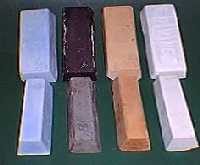 These are Caswell's buffing compounds (photo credit to Caswell, Inc. Their URL is listed below). The blue compound is for buffing plastic. White is as fine as you'll use on metal. In addition, Dave uses Red Jeweler's Rouge as a final step. Here's how Bill proceeds. It's tedious, but the results are worth it. Loose flannel wheel with red jeweler's rouge for mirror finish. The compound is deposited on the buff by pushing it into the buff while it's turning. The buff heats it up until it melts. Rick Jemison has found that loading the buff up the night before he works allows the buff to load up and then cool. The next evening when he fires the setup up, it really cuts! Rick Jemison also states that his setup does not lend itself to changing buffs. It takes him about 5 minutes to remove a buff and put another on. He has got two ends on his setup and has a spiral sewn 6" buff on the right and a loose cotton buff on the left. The left buff gets only jewelers rouge. The right buff gets everything else! Rick says that he is not recommending this, and agrees that never mixing compounds is the "correct" way to go. He has found that he does a lot of jumping back and forth in compounds, and the results he gets by mixing coarse and medium compounds are acceptable to him. Otherwise, he states that he would need a 4 wheel buffing setup. Jeff Turner, again following the tip from the SabMag list, recommends you Polish with tripoli loaded cotton buffing wheel. Then hand polish using some stuff called MAAS -- very similar to Honda polishing cream. Don't forget to apply a good paste wax after washing your polished part with a good detergent and water. 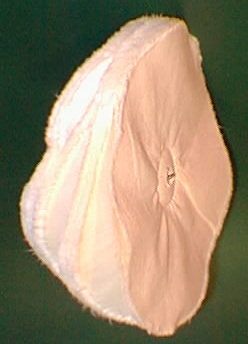 Dry with a soft clean cotton cloth. NOTE: your polished part is very susceptible to scratches so make sure the drying cloth is absolutely clean. Wax will keep your polished part from getting water spots the next time the part gets wet from a wash, rain or puddle. By the way, don't kid yourself about never needing to do this again. You will have to do it again if you want it to stay looking this good. There are some products out there that claim to be a high gloss finish that will protect your polished part. Several people on the list have tried a number of these - all with disappointing results. None look as good as a simple paste wax finish. They all tend to give the polished piece a semi-gloss, satin, or otherwise dull finish. On the other hand they will protect the finish much longer than a single waxing. Finally, a word on safety. The process of polishing throws out a lot of coarse and "not so coarse" debris..... at high speed! Avoid wearing loose fitting clothing, short pants and short sleeve shirts. Wear a dust mask and hearing protection ... don't try this process without them. Finally, gloves are very important not only to protect your hands, but also for grip - polishing generates a great deal of heat and handling hot parts can cause 2nd degree burns. You don't want to lose your grip on a small piece you are polishing while holding it against a wheel spinning 4000 rpm! Using vice-grips with taped or padded grips is a great idea with smaller parts. Better yet, only polish smaller parts which are secured in a vice with a Dremel tool. Losing one's grip on small parts, e.g. bolts, nuts, etc. can cause a lethal or expensive problem as the wheel turns the part into a high-speed projectile. The Shine Shop... if you are looking to have someone else do it for you! Last edited by crazy steve; 02-08-2012 at 08:25 PM.